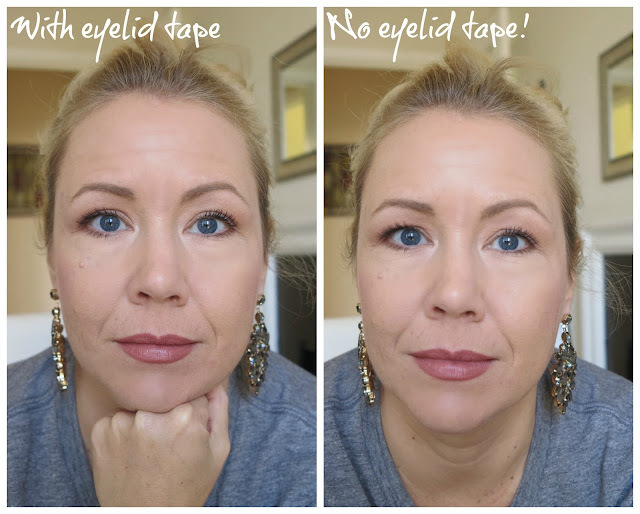 Eyelid tape for hooded eyes- does this really work? 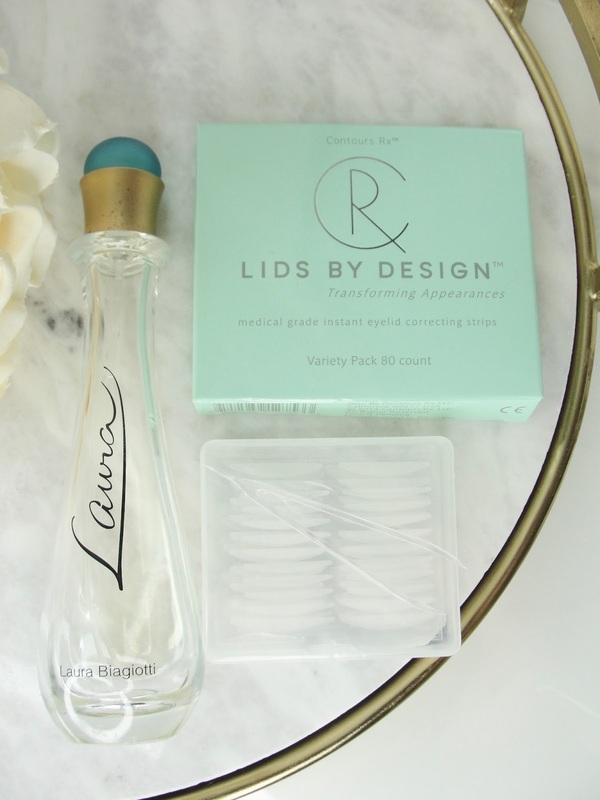 I really like how the tape comes in a little clear box with a little tweezer. You can store this neatly and I find the idea of the variety pack very convenient to try out all the sizes. Back to the picture above my post: can you see the difference? Well, I have the eyelid tape on on the left picture and no eyelid tape on the right. Did you see it? Thing is, you need to see a "front picture" of me, because my "trouble eye" is definitely the left one. If you look close enough, you will see that my left eye is a little bit more open on the picture above on the left image, basically you can see a little bit of my eyelid, which usually isn´t the case. Here is my front face- you will be able to see better that my left eye is opened up a little more with the eyelid tape. However- the difference with eyelid tape of my right eye isn´t big. 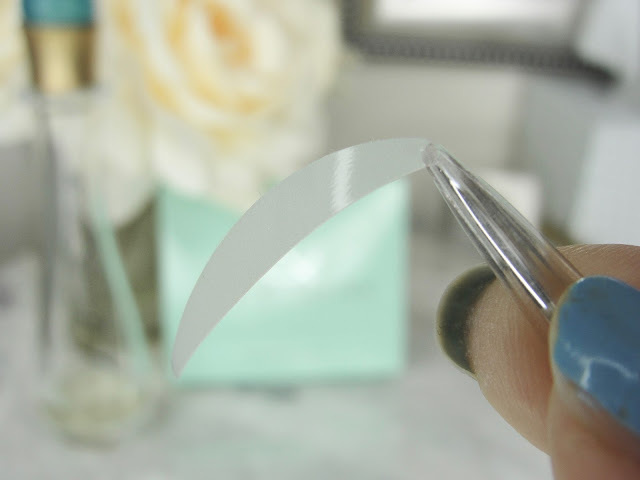 You guys, I have tried the tape in different sizes and on different occasions (since July! ), but I have a couple of problems and I really wanted to love these! 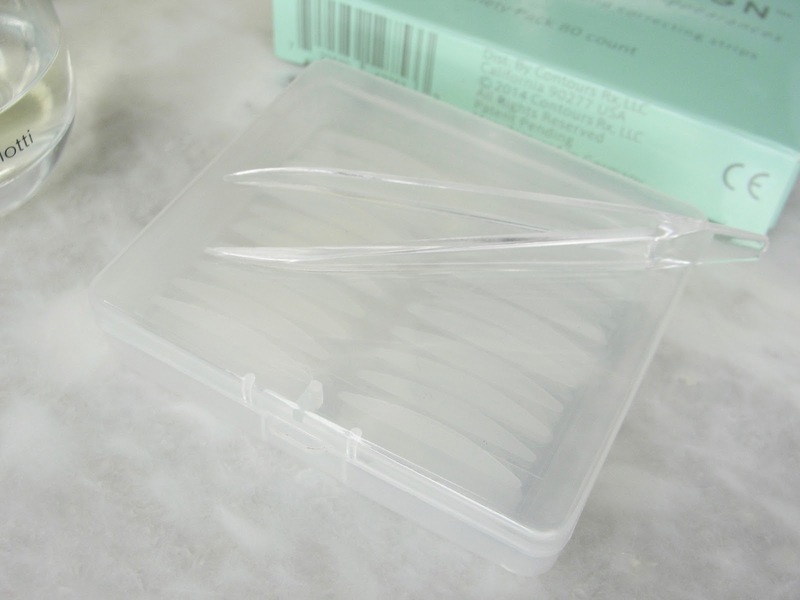 Look, if applied correctly, these can give amazing results and literally be "eye-opening". However, I wasn´t able a single time to apply them in a way, that I felt like both eyes look symmetric. Well, my eyes look naturally not symmetric- and chances are yours are too. Never did I know, before trying these, just how different both of my eyes are! Now I know that my left eye seems constantly closed compared to my right eye...grrr. And it is nearly impossible to balance that out while using the tape. For the picture above I spend one try for my right eye- but about 3 tries (and wasted 2 eyelid tapes) to achieve a half-way decent result on my left eye. Also: as long as your eyes are closed, you won´t see the tape, but obviously we blink all the time, and while not immediately obvious, I would feel very awkward, if somebody would notice the tape! 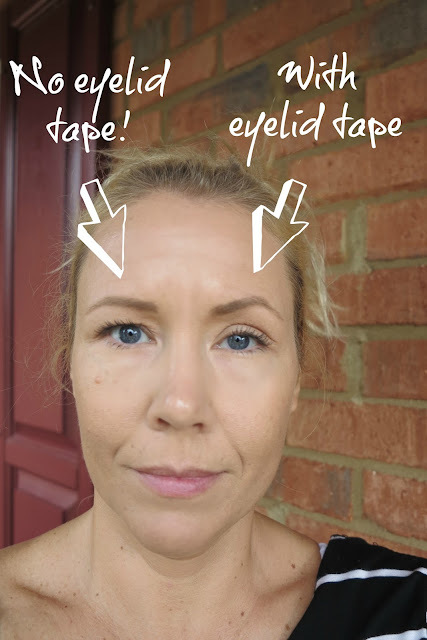 This is how the eyelid tape looks like on closed eyes- even with closed eyes you can see that my left eye is my "bad eye"
And how do they feel? You know: if applied correctly, they feel nearly undetectable (like it feels on my right eye!)! That is great! Only that I am apparently an idiot! Cause I can´t apply it like that on my left eye. And then it feels uncomfortable- just like tape! I don´t know why! Is it cause that eye is too hooded? Check out on the pic below, when I used a huge eyelid tape to demonstrate the difference when wearing the eyelid tape vs. to not wearing it. 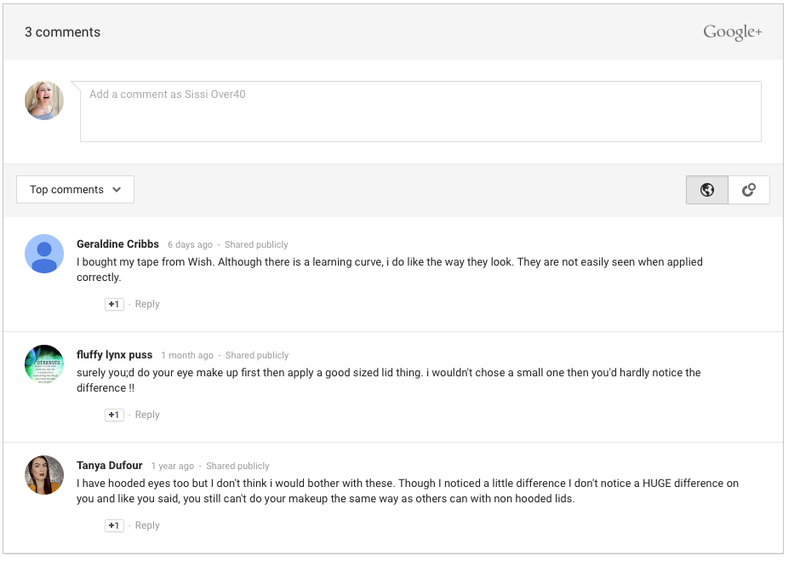 And it looks especially dramatic, cause I used the tape on my "good eye" (right) and not on my "bad eye" (left). While the tape truly opens up my right eye like nuts, I find that eye also looks very strange and somehow tired to me! Weird, right? Shouldn´t the open eye look more awake? 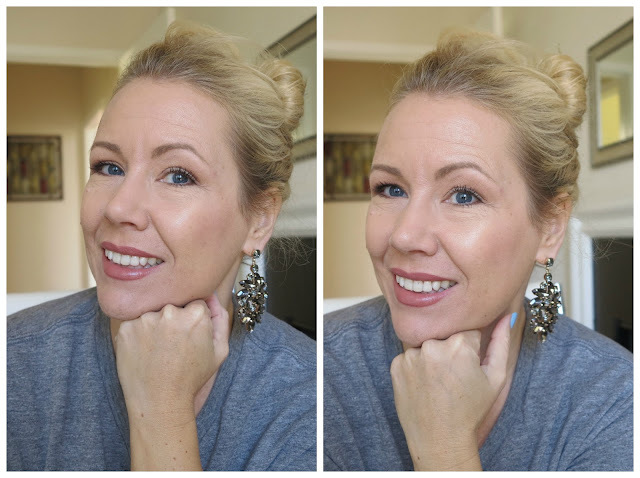 Maybe I am used to my hooded eyes, but I like my hooded eye (left) (yes, you can´t see a thing of my lid!) much better! LOL! My husband always made funny comments when I wore the eyetape and usually said something like: "you look tired". And I didn´t even tell him, that I applied the tape on these days. 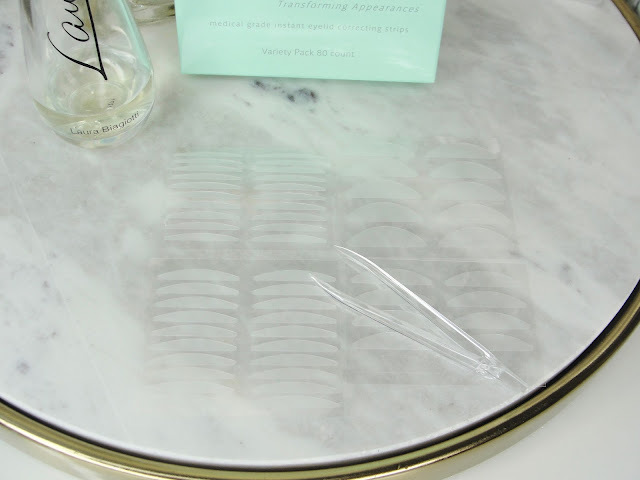 I just feel like, whenever I wear the eyelid tape, the person in the mirror does not look like me. Guess, I am just a hoodie! Geez, I would look weird if I would not have hooded eyes! Hehehe! 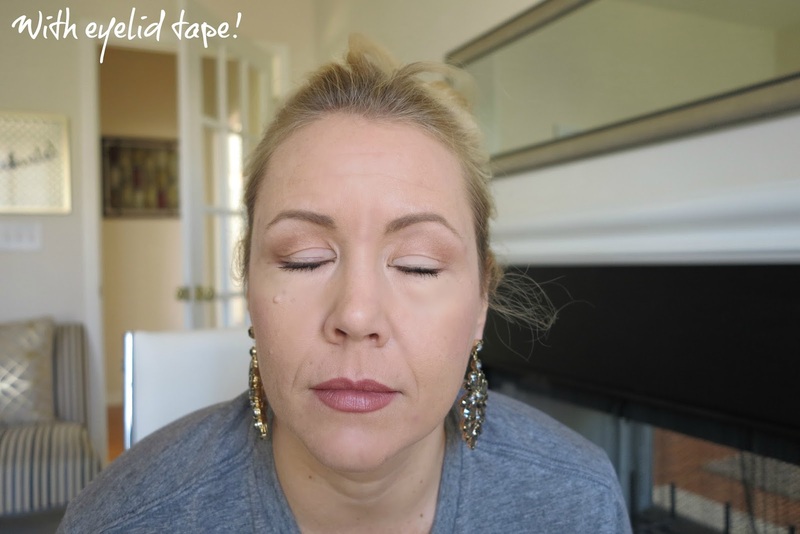 Also: one of the reasons why I thought I would like to not have hooded eyes (and if only for a day) is to create these gorgeous makeup looks I see on YouTube from these big eyed gorgeous beauty gurus- but with the tape I still can´t apply the eyeshadow that way, cause I can´t put eyeshadow on the tape. For these reasons, the eyelid tape is for me personally a pass. Have you ever tried eyelid tape? Disclaimer: I received the products mentioned above for free. Regardless, I only recommend products or services I use personally and believe will be good for my readers. 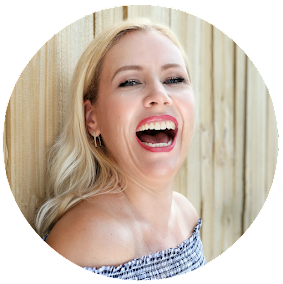 Contains Affiliate link. Read my full disclosure.